One of the main reasons I wanted to learn more about essential oils was to help my kids. We value real food and non-toxic living in our home, which thankfully means we aren’t sick often… and essential oils don’t replace necessary medical attention, but they are a wonderful companion to natural living. They support a healthy, happy body. And because they work, they are usually my last line of defense, too. 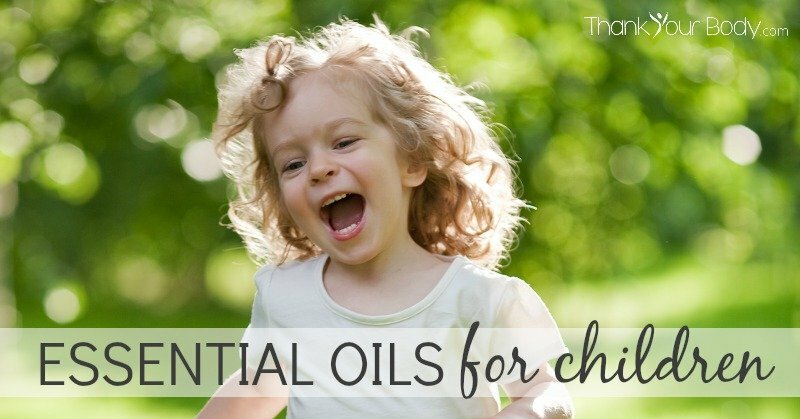 For young children it’s a good idea to dilute all essential oils before applying. You want to avoid any possible skin irritations. There are some exceptions and plenty of moms who have used some oils “neat” (undiluted) without any problem, but since diluted an oil does NOT dilute the effectiveness, I always prefer to dilute my oils. A good rule of thumb is to dilute one drop of essential oil with 1 tablespoon of a carrier oil such as coconut or olive. Healthy Immune System: Dilute 1 – 2 drops thyme or lemon in 2 Tbsp. of a carrier oil. Massage a little on neck and chest. Healthy Digestion: Dilute 1 – 2 drops of rosemary, ginger, or orange in 2 Tbsp. of a carrier oil. Massage on stomach and feet. No More Boo-Boos: Add 5 drops lavender and 5 drops melaleuca to a small bowl of warm water. Use this water to clean the cut. Then apply 1 drop of lavender to a Band-Aid before using it to cover the wound. Do not apply the lavender directly in the cut as this will sting! Healthy Skin: Dilute 1 – 2 drops sandalwood in 2 Tbsp. of a carrier oil, and apply a small amount on location. Healthy Ears: Combine 2 Tbsp. of a carrier oil with 2 drops of lavender, 1 drop Roman chamomile, and 1 drop melaleuca. Put a drop on a cotton ball, and apply in ear, behind the ear, and on reflex points on the feet. *As a reminder, I only recommend Young Living oils. And I highly recommend getting the premium starter kit that comes with 11 of the most popular oils including lavender, lemon, and frankincense (all of which I use a lot with my child!). Learn more here.